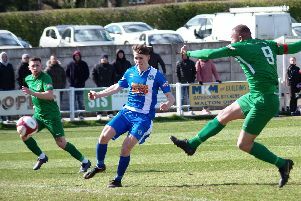 Ovenden West Riding and Ryburn United won’t have to wait long for their first ever West Riding County Amateur League clash. The pair are set to meet in next season’s fourth set of fixtures, on Wednesday, August 29, at Ryburn’s Ripponden Wood ground. Ryburn have joined the CAL having withdrawn one of their two sides from the Haslem-Sheppard Halifax AFL. Ovenden have played in the CAL for many years. They took a year out in 2016-17 due to a player shortage but returned strongly last term and were runaway champions of the lower of the two divisions. Previously the pair might only have met in the Halifax FA Cup, in which Ovenden have a particularly good record. The CAL will have only one section, a Premier Division of 15 teams, in the forthcoming season and play at level seven of football’s pyramid. Ryburn United, AFC Bingley and Toller FC from Bradford have joined and several teams have departed. Ryburn start their campaign away to Golcar United on Saturday, August 18 while Ovenden travel to Steeton Reserves for their opener four days later. Fixtures - Saturday August 18 (2.30): Dram Community FC v Route One Rovers, Golcar United v Ryburn United, Lepton Highlanders v Bradford Olympic, Littletown v AFC Bingley, Lower Hopton v TVR United, PFC v Toller FC, Wakefield City v Steeton Res. Wednesday August 22 (6.15): AFC Bingley v Ryburn United. Bradford Olympic v Route One Rovers, Golcar United v Littletown, Lepton Highlanders v DRAM Community FC, Steeton Res v Ovenden West Riding, TVR United v Toller FC, Wakefield City v Lower Hopton. Saturday August 25: AFC Bingley v PFC Littletown v Steeton Res, Ovenden West Riding v Lepton Highlanders, Ryburn United v DRAM Community FC, TVR United. v Golcar United, Toller FC. v Lower Hopton, Wakefield City v Route One Rovers. Wednesday August 29: AFC Bingley v Steeton Res, Golcar United v Lepton Highlanders, Littletown v Wakefield City, Lower Hopton v DRAM Community FC, PFC v Route One Rovers, Ryburn United v Ovenden West Riding, Toller United v Bradford Olympic.